The first shipload of liquefied natural gas (LNG) arrival to the LNG import terminal in Tornio, Finland, on Sunday November 19, 2017. 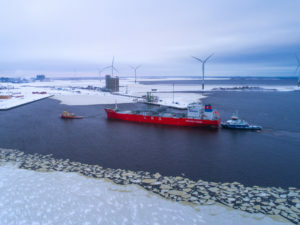 The Manga LNG natural gas import terminal in Röyttä Harbor, Tornio, is a joint venture of the industrial companies Outokumpu and SSAB Europe, the energy company EPV Energy and the LNG company Skangas. LNG was shipped to the terminal by Coral Energy, a time-chartered LNG carrier operated by Skangas. Once completed in summer 2018, the import terminal will be the largest LNG terminal in the Nordic countries and the second LNG terminal in Finland. Northern Finland’s gas and fuel market will be diversified as a new fuel – LNG – enabling deliveries to industry, marine transport and heavy-duty road transport outside the gas pipeline network will become available in the market. 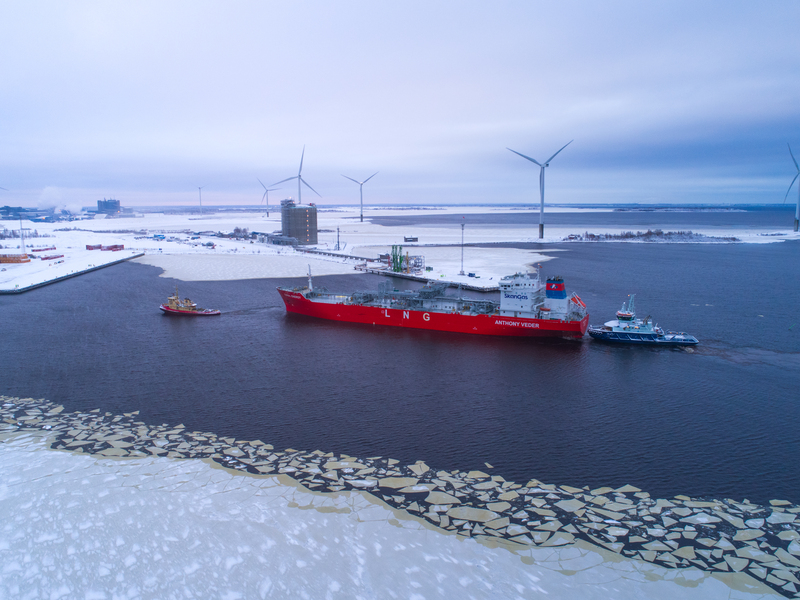 Once completed, the Tornio LNG terminal will serve the entire Bay of Bothnia region as well as industrial and mining operators, maritime transport and heavy-duty road transport in Northern Finland, Northern Sweden and Northern Norway. Wärtsilä, the company responsible for construction delivery, is now preparing the terminal for commissioning. Commercial deliveries to customers such as Outokumpu Tornio Works, EPV Energy and SSAB Raahe will begin in summer 2018. ”We’re increasing the competitiveness of our steel mill by switching from propane to LNG. At the same time we’re reducing our production costs thanks to more stable energy prices. Our aim is to cut our direct carbon dioxide emissions by 2020, and switching to LNG supports this target very well,” says Martti Sassi, Senior Vice President, Head of Operations, Tornio, from Outokumpu. Access to LNG is an important competitiveness factor for current industrial operators in the area as well as for the Port of Tornio. The terminal aims to respond to the needs of industry as well as maritime and road transport, and an LNG logistics chain will also be completed for the site. Maritime transport customers will include LNG-powered cargo ships and the new icebreaker Polaris. The construction of the Tornio import terminal has progressed according to the planned schedule without any accidents resulting in absence from work. The project’s total investment is around €110 million. Once operational, the terminal will employ around 7 people directly and around 30 people indirectly.